Prominent & Leading Exporter from New Delhi, we offer ac frequency drives. We bring forth AC Frequency Drives that cover every automation application need in the industrial plant. These AC Frequency Drives incorporate the latest technological advancements in AC motor speed control, made possible by experience and dedication to quality in design and manufacturing. The adjustable frequency drives offer the greatest selection of size and performance available, with power ranges from fractional HP to 1500 HP. 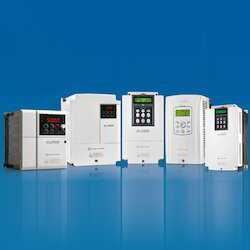 AC Variable Frequency Drives that has gained wide appreciation for international quality standards. Designed with the assistance of our advanced technology, the frequency drive efficiently generates strong torque at a low speed. The drive adjusts output voltage and slip frequency compensation timely to make motor work at the highest efficiency. The Frequency Drive s provides increased efficiency and product life for today's machinery applications. These easy-to-install adjustable frequency drives also feature a compact design to fit into tight spaces. These are designed to provide adjustable speed control of Single phase or three-phase motors. The size and simplicity of these drives make them an ideal choice for installations where space is a primary concern. The AC Frequency Drive ensures reliable and accurate load handling. Operating on real current vector control technology, it efficiently generates strong torque at a low speed. It has a built-in PID controller with sleep, wake up functions to maintain a constant pressure, flow and oil level. It has gained wide appreciation for automatically keeping the output voltage stable, even when the input voltage fluctuates. Looking for AC FREQUENCY DRIVES ?